The autumn has arrived. A change of season. This time of year is one of my favorites, however, I do feel the shift within me to become a little sad. I love the summer and I am always sorry to see it go. The shorter days, cooler weather and dying of the summer flowers creates a space within me to reflect on the things that I must let go of. It is a time to begin to go inward and look at what I am ready to release. Change, is inevitable. The question is, are you willing to change? Are you willing to go inward and reflect on what you desire to create and make new. Collectively we can create a world that is changing for the good. 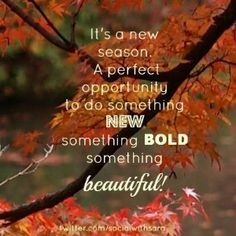 Look within yourself, you will find the answer to do something new, something bold and something beautiful!